As long as it's a water based show. Theatre based productions for marine cetaceans are a bit of a no no, For obvious reasons. Of course there are other limitations too, Such as an Orca's inability to tap dance or sing coherently. So I suppose whistling and splashing themes would be better suited to a killer whale's talents. A pool based version of happy feet would be great as Orca's would make great Penguins. Do you think people would want to see such animals in person or do you think everyone should be limited to pictures or old video? If people want to see them in person, They have two basic options. Either they can see them in captivity or to invade the animals natural habitat. From what I have read, SeaWorld San Diego has 10 Orcas, Most of them born in captivity where millions of people get to see them and many other sea animals in person each year. Other people who want to see them in their natural habitat have to invade their habitat to do so with no guarantee that they will see any of the animals much less orcas. These boat tours can interrupt mating, Scare away their prey, Spill fuel and litter in their habitat, And even cause direct harm to them or their calves by impact. Imagine if we had many millions more (11 million per year for SeaWorld visitors alone) going out on these tours. What impact would that be to their lives? We can either keep a few health in captivity or risk the lives all of them by invading their natural habitat in droves. If water animal parks are banned because they can be cruel to a few and boat tours are banned because they would endanger the many, The only option for anyone to see these animals would be in old photos or videos of the past. This would pose a different issue. Would it even matter if they actually existed? Look at the Thylacine also known as the Tasmanian Tiger. It is believed to have gone extinct back in the 1930's but there are still unconfirmed sighting of them in the deepest parts of Tasmania. If all we have is old pictures and video of them, Does it matter if they still exist? If we don't have the opportunity to see them for ourselves, We will never know if they still exist or are just fake/false sightings. I could tell you that raptors still exist on a secret island. This island is prohibited from humans to protect the dinosaurs that live there. Would you just believe me or would you want first hand proof before accepting my claim? Obviously the latter, Because otherwise you would have no reason to believe they are not extinct and my words that they exist would not matter. They're fun to look at. They're fun to look at. 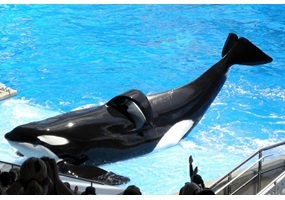 Orcas like being enclosed and abused by captors! They're also yummy to eat. I mean the #1 thing to eat while watching a good ol orca torture show is fried orca. Mmmmmm. Tasty. I love watching wild animals be regularly whipped and tortured! . Great sport. They should not be in shows because they are harmed. They get harmed by being in captivity. When orders are in captivity their dorsal fin bands. One time at sea world in orcas fin bent so far that it cut in half. That orca died at the age of 10. In wild they live in a huge ocean at sea world day live in a tiny bathtub like tank. How would you feel if you lived in a bathtub for 35 years. That’s hell Tillicum a baby orca felt. He started in the ocean then she was taken and put in Canada after he ate a trainer in Canada aTillicum a baby orca felt. He started in the ocean then he was taken and put in Canada there he was In tiny tank. Then at Night he was put in a even tinier tank and got beat up by two female or guys they were mad that they were in a tiny tank. In the morning Tillicum ate one of the three. Trainers. Finally he got sent to Swirled he ate two trainers when he ate his Second one sea world Said it was trainers error but it was’t. Tillicum did it on purpose because he was mad. He died at sea world at the age of 35. Said it was trainers error but it was’t. Tillicum did it on purpose because he was mad. He died at Seaworld at the age of 35. Have you been to seaworld? If you have you just payed money to help whales, Orcas in particular be deprived from their home the ocean and be held captive in cages. They are forced to perform in shows. They are not able to hunt for their own food. And they are separated from their family. Orcas are wild animals and wild animals should be free. Not placed in tanks that barely have enough room for them to move around in. Orcas need to swim up to 140 miles a day. When they are locked up in those tanks they would need to swim 4, 280 laps to reach that goal. When orcas are kept captive they have what is called a collapsed dorsal fin, Because they have no space to swim freely. Seaworld claims that this condition is common but in the wild this is a very uncommon condition. This condition is a sign of an injured or unhealthy orca. This is when their upper fin collapses, Which means they won't be able to swim up to the same speed they used to. And it causes a lot of pain. Orcas are also fed an unnatural diet of thawed dead fish while held captive. Another crucial reason orcas shouldn't be held captive is because while held captive their life span is about 14 years but in the wild they can live up to over 100 years! In the wild there has only been one single report of an orca attacking a human. Because of the stress they get when they are deprived from everything important they naturally need while held captive, Orcas have attacked and killed 3 humans and have injured more. In Seaworld orcas that are held captive are fed "drugs". Ex seaworld trainers have listed many medications that they had to give the orcas like Antacids, Antibiotics, Antipsychotics, Benzodiazepines, And Contraceptives. Orcas are not made to digest medications so this can severely harm them sometimes leading to death! The most common reason for feeding them these drugs is because when orcas are in tanks they don't have the option to hunt for their own food. This is not good for orcas since they are naturally made for hunting. Orcas suffer from depression and other diseases since they are not hunting ( and since they are not free). So to prevent orcas from suffering from this, Instead of releasing them they drug them. Orcas should be free. Keeping them captive is the same as slavery for humans. Nowadays slavery has stopped. So orca slavery should stop too! To help the orcas do not go to Seaworld and give them any money and spread awareness. Orcas only wish to be Orcas and to do the things that Orcas do. They do not wish to be in shows. Exploitation of these creatures results in further endangerment of precious life on our planet. If you wish to see Orcas without endangering them, Or others, Please visit YouTube. Orcas do not like being in enclosed areas. They like to be in open water and not in shows because they would not be able to improve their hunting skills if they are young, And if they are adults, Then they might not out of weird water. Also, They might not be treated as well in human hands. Do you think Nicki Minaj's nip slip was on purpose? Did Kanye West create the Yeezy sneaker as a publicity stunt? Will Dany win the Game of Thrones? Do video games and television really need violence? Breaking their silence: Should Beyonce choose between her sister and husband?